Los Angeles party supply stores and party rental company list. You can find a local Los Angeles, California (CA) party supply shop, from our online Internet 360 CA business directory listings. Includes phone numbers, product information, delivery information and more. Party Supplies places in Los Angeles, California. Los Angeles party supplies. Decorations for any type of Events, Weddings, Quinceñeras, Sweet16, Birthday and more. A complete source for decorations: balloons, centerpieces, banners, garlands, party favors, cutouts and more. Located in the heart of Hollywood at 5969 Melrose Avenue, for the best selection of party supplies ever. Founded in 1995, Joker Party Supply Inc is a wholesale and retail party supply store based in Los Angeles, California. Products includes Balloons, Party Supplies, Helium GasCylinders, Decorations, Piñatas etc. Custom party supplies superstore in the heart of downtown Los Angeles. Over 20 years of LA’s Party supply business with the biggest selection of Piñatas, Licensed Party Supplies, Favors, Balloons and Candy. Navarro’s Party Supply stocks thousands of specialty items like ‪Decorations‬, Toys & Gifts, Candy, Mexican Dulces, Custom ‪Pinatas‬ and Balloons for occasions such as Birthdays, ‪Quinceaneras‬, Weddings, Baby Showers, Luaus, Surprise Parties, Bridal Showers, Bachelor Parties, Pool ‪Parties‬, Receptions, Dances, Balls, Fundraisers, Holiday Parties, Graduations, Housewarmings or any other ‪Celebration. Founded in 2012, Tip Top Party Shop offers party supplies at discount and wholesale prices in the heart of Los Angeles’ Toy District. Sells officially licensed party themes (Angry Birds, Toy Story, Hello Kitty, Disney Princess, Cars, Mickey Mouse and more), large selection of Cake decorations and Mylar Balloons etc. Resellers are welcome. Located in the greater Los Angeles area with 3 warehouses. American Celebrations a distributor of licensed and non-licensed products both for wholesale and retail customers. 4927 Pacific Blvd., Vernon, CA 90058.
Business since 2006. K & A Party Supply & Flowers is a wholesaler and distributor of party supply, artificial flowers, plant and decoration accessories. PartyFavor123. One-Stop Shopping for Wedding & All Special Occasions (Mis XV, Sweet Sixteen, Anniversary, Baptism, First Communion, Baby Shower etc). 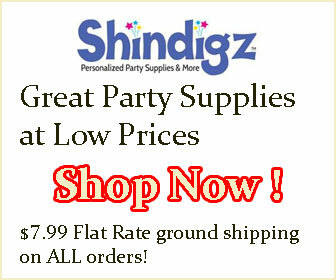 Find all your party supplies needs in one spot. Mexican Candy, Mexican Party Supplies, Mexican Products. Offers a great selection of high quality Piñatas – Dora the Explorer, Disney’s Princesses, Tinkerbell, La Chilindrina, Corona Bottles, Angry Birds, Estrellas with different characters and of difference sizes, Thomas the Train, Batman, Cars, Sponge Bob, Hello Kitty, Toy Story and many more. Party, wedding and craft supplies at wholesale prices. Hollywood Theme Party Supplies, Memorabilia, Movie Decorations, Gifts, Reels and Posters, Standups, Award Trophies, Clapboards, Celebrity Photos, Film Cans and more. Importer and seller of decorations and gifts, party supplies, home decorations and feng shui items, paper lanterns, parasols, wedding favors, garden statues, jade statues, wall fans, hand fans, scrolls and more. The Feather Place Los Angeles is the 2nd showroom of New York City’s popular shop The Feather Place. Sells wholesale and retail products of Craft & Costume, Fashion & Jewelry Design, Bridal & Lingerie, Millinery, Holiday, Decor and more. An online party rental company serving all cities in Los Angeles County. Inflatable Bouncers, Jumpers & Slides, Canopies & Tents, Tables & Chairs, Table & Chair Linens, Patio Heaters, Helium Tanks, Party Lights, Special Effects Machines, Food & Beverage Machines, Props, Portable Restrooms & Wash Stations and more. Located in Downtown LA California. Importer and wholesaler of Artificial Flower, Mis XV Anos, Baptism, Ribbon, Lace, Bridal Supply, Party Favor Supply, Balloon, Wire craft, Precious Moment Dolls and Baby Shower etc. Everything’s $1 or less. Party supplies located in Los Angeles, CA. Products includes party supplies, office supplies, household & cleaning supplies, home decor & seasonal products etc. 6 Stores in Los Angeles area. El Payasito Party Supply Co.
A family run business for over 35 years. Mexican candy, Pinatas and Party Supplies in Southern California. Jumper rentals and pinatas, decoration for any special event, rental of helium tanks, heater rental, canopies, chairs and tables, souvenir etc. Products and services are renting equipments – bouncer, trackless train, machine, clown, character or festive arrangement of party supplies. Costumes, birthday party supplies, baby shower favors, candy, custom banners, theme parties and more. Balloon re seller, Helium Tank Rental, Tableware and decoration, Snow Flake Machine, rent DJ Lighting & Speakers, Jumpers, Tables and Chairs Rental and many many more. visit website for more details. BJ Party Supplies, Inc. is a successful Event Planning, Coordination and Creative Design service, based in the Los Angeles area. Custom balloon delivery service in Los Angeles area. Serving all of Los Angeles County and Parts of Orange County. Home, school and hotel deliveries available. Jumpers, Canopies, Tables, Chairs, Linens, Children’s Face Painting, Catering Services & more. Serving Boyle Heights, East Los Angeles, City of Los Angeles / L.A. County & Surrounding Areas. Party Designs by Dina is a high-end linen rental and custom design company. Specialize in tablecloths, napkins, decorative napkin bands, chair covers, chair treatments, table runners, custom linens, TV/Film set decor etc. Provides customized balloon decorations in many themes and colors. Party Divine is open by appointment only. Wholesale & Supply Store. Comseat has been providing quality folding chairs, tables and other rental equipment for over 10 years.